What's the difference between Храм, Церковь, Собор and Часовня in the Russian culture? Once I prepared some material for students learning the Russian language. The material was about buildings in a city. Turning over them I run into the thought that Christian buildings have different names. And how can we explain their differences to a student if most of the Russians don't even know it? So, I had to take a little investigation, and this article is about it. You can notice that the buildings dedicated to worship have different names in Russia. What's the difference betweenХрам, Церковь, Собор and Часовня in the Russian culture? And are there analogues in the English one? 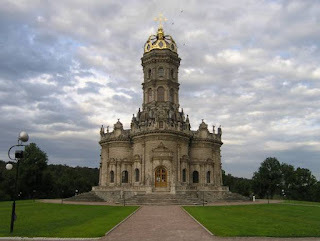 For the Russians Храм means a building that contains an altar and where church services are offered. 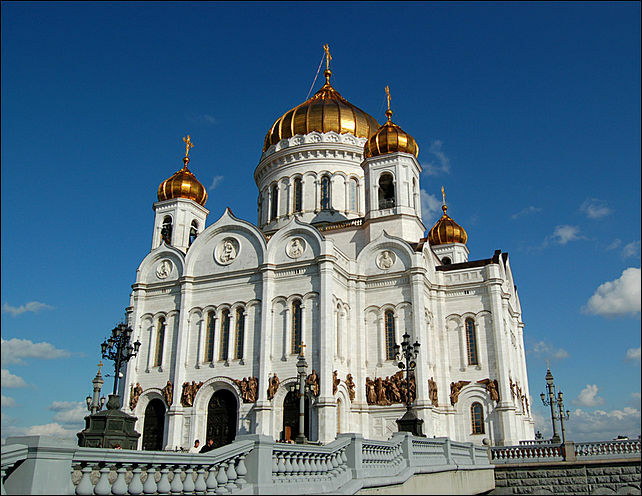 It is not like a temple because the Russians use the term "temple" for a building used for worship in some religions other than Christianity. We now know the reason why Храм Христа́ Спаси́теля is not a temple. But why is it Cathedral? 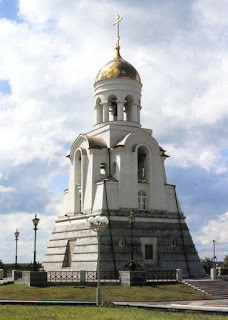 Храм Христа́ Спаси́теля is a popular name with the Russians though it's official name sounds as Кафедра́льный собо́рный храм Христа́ Спаси́теля [kafedralny soborny khram khrista spasitelya]. So, yes. It is the most important church in the area that a bishop controls. "Кафедра́льный собо́рный храм" = "Собор" which is translated into English as Cathedral. 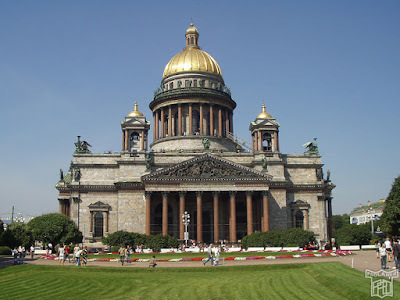 Це́рковь is any Christian храм and defines not only a building, but also a group of people who come together to worship. 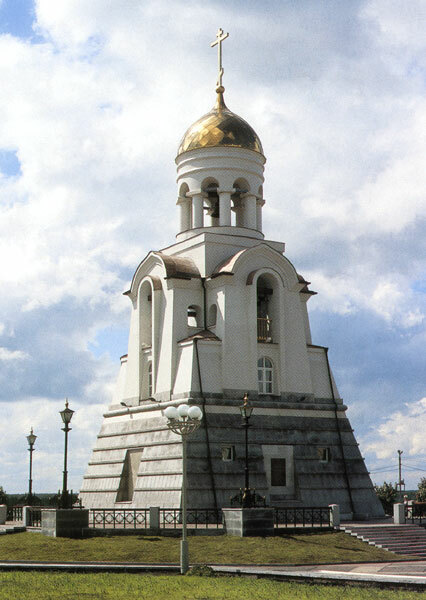 Церковь = church. Собо́р is a main церковь of a cloister or a town. It is possible that there are several Соборов in a city like in Moscow and St.Petersburg. "Cathedral" is the right word for this case. Часо́вня is a little building without an alter. So, I wouldn't translate it as chapel because in the English language a chapel contains it. But this is a common version for часовня. You won't be criticised if you name all these buildings Храм because it can be applied to all of them except Часовня. Come to Russia and learn more interesting things about it! WILL BE BROUGHT ON ST. KALININA-PROLETARSKAYA. 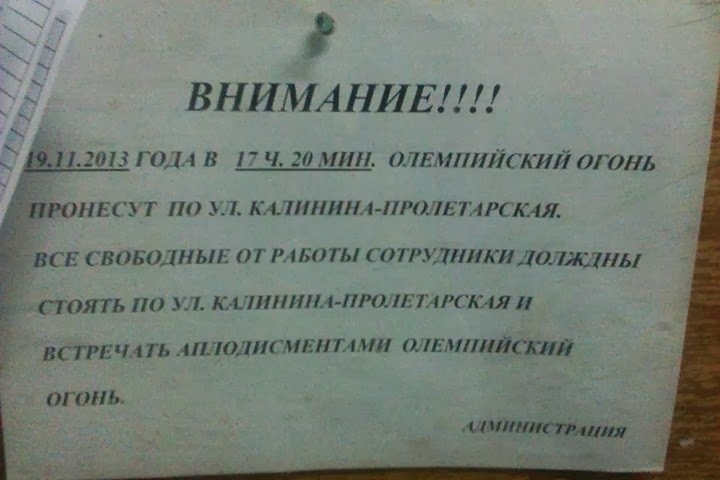 And there is a mistake in the word „Олемпийский”. There is a tradition to bring the Olympic fire with torches from Greece to the game host country. In 2014 it is Russia with Sochi city. By the way Sochi is a resort place for most Russians with very warm climate, ideal for Summer Winter Olympiad. But here at first we will look at the torch, special Russian olympic torch. What so special, you perhaps wonder? The torch was made in Krashmash factory for at least 66 million dollars. This government company produces ballistic missiles, so the torch as was presented "does not go of under water and the wind of 60 m/s". Let us talk about this funny guy in white suit. 1. In 1974 January, 7 he was going back from the swimming training center to home by city bus. Driver had some problems with engine, stopped the bus on the upsurged road and went out to fix the problem. At that moment the bus with 30 passengers was moving toward precipice without driver! Shavarsh stood near the driver cabin, immediately broke the window and drove the bus to safe place. Answering on the question "How it was possibly to do it?" he made famous phrase "Просто я был ближе всех" (Simply i was the nearest). 2. 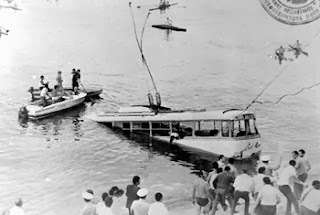 In 1976 September, 16 the trolleybus that was gone on dam fell in Ereven lake. 92 passenger stayed with death under the 10 meter of turbid water. 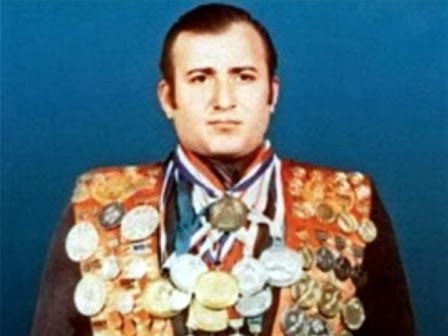 All of them were doomed to be dead, but one accident: in that same day Karapetyan had morning scamper with his brother and trainer near the lake. Later the experts admit that nobody in the world could do what did Shavarsh. He dove under the turbid water, broke the back window of trolleybus and started to pull out senseless passengers. More than twenty minutes in cold water. Twenty saved lives. Actually he caught up more persons, but not all were saved. After that answering on the question "What was the most scary?" Shavarsh answered: "I definitely knew that even with all my skills I have only several plunges. There on the bottom the visibility was zero, so I caught man by touch and swam up with him out. One time I came up and saw that in my hands was ... leaser pillow from a seat. I was looking at it and understood that the price of my mistake - somebody's life. This pillow then not only once came to my night dreams". Karapetyan was moved to the hospital. He was thought that everything will be alright, but the power of a man is not limitless. He had hard pneumonia, the body temperature was more than 40 degrees. After 46 days of throe he came back to normal state, however doctors were more pessimistic. Every breath was with huge pain. The carrier must be stopped. Nevertheless in next year he became a European champion, USSR champion and broke the world record in 400 meter distance in fin-swimming. However because of the repercussions of the injury he stopped his champion carrier. In 2013 Karapetyan got the award as the most distinguished Armenian man of the time. There is curious situation with russian verbs "петь" (sing) и "пить" (drink). 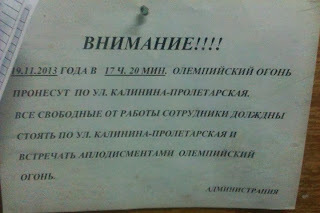 Thus "пейте" (what is meaning "you, drink") is not sing! среда, 10 марта 2010 г. Our american fellas are going crazy today, the reason is the video recorded in USSR in 1974 where one russian singer performed the song with phonogram.